TL; DR: As the pioneer of the discipline of technology business management (TBM) and a leading provider of cloud-based software for running the business of IT, Apptio has more than earned its reputation as a trusted market leader. 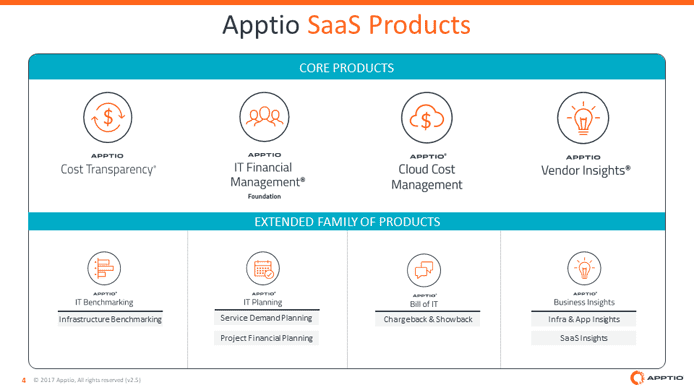 Hundreds of customers turn to Apptio’s proven SaaS applications and analytics platform for insights on the cost, value, and quality of technology investments. Jarod Greene, Apptio’s VP of Product Marketing, told us how Apptio and TBM are elevating the role of modern IT leaders within their businesses. When Gerry Imhoff, CIO of Maritz, was asked to expand a chargeback policy to recover IT costs from the business, he did what any tech leader would do — he pulled out spreadsheets and built cost models. Unfortunately, the effort didn’t win him any popularity contests. His report, which doubled IT costs to business units, was met with skepticism, and he was told to decentralize IT decision-making. The final blow? He needed to slash his IT budget by a whopping $18 million. 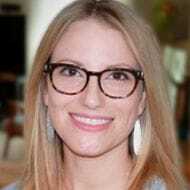 “That’s where the call to Apptio came in,” said Jarod Greene, Apptio’s VP of Product Marketing. Gerry needed to quantify his department’s value — and he knew Apptio’s technology business management (TBM) methodology and solution set could help him do just that. Apptio’s Jarod Greene told us the company’s solutions are helping CIOs and CTOs convey IT value through TBM. The strategy embedded TBM into Maritz’s service culture, changing the perception of IT from a cost center to a trusted business partner. Meanwhile, IT became a preferred provider of centralized services within a decentralized ecosystem controlled by individual business units. Using Apptio’s Cost Transparency solution, owners of those business units could, for the first time, truly understand the effect of their consumption on IT costs. Ultimately, the awareness provided through cost transparency reduced Maritz’s IT spend by 40%, satisfying the mandate to reduce costs by $18 million. Jarod told us it’s common for Apptio Cost Transparency customers to reshape their company’s dialogue around IT value. In Gerry’s case, “Where he would raise his hand to ask for money and resources to possibly be told no, he’s now able to retire legacy infrastructure, limit technical debt, figure out what the cost drivers are, and fund initiatives that grow or transform the business,” Jarod said. Apptio has enjoyed global success in its mission to help clients articulate the value of IT, implement strategic plans, and engage with the business at large. The platform unlocks financial and IT data from a company’s existing data sources — think ITSM systems, project management modules, and IT operations management tools — and ingests that data to make financial sense of how IT translates into business value. 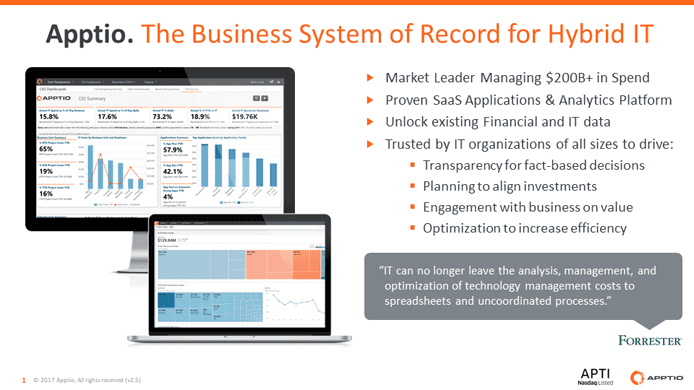 Apptio’s TBM applications and analytics empower businesses to make data-driven decisions about IT investments. Jarod told us this also aids with strategic planning. And Jarod noted this is particularly useful in facilitating engagement between departments. Every business has to perform cost reporting, plan, and educate stakeholders about how IT functions across the organization. When you think about it, most functional areas of a business organization are governed by a strategic framework. Sales has CRM, HR has HRM, marketing has RPM, and finance has ERP. But IT has historically been left out in the cold. That’s why Apptio introduced a new strategic category: technology business management. “TBM allows organizations to shift the conversation from what we’re spending, in terms of cost, into value,” Jarod said. The methodology is even backed by the TBM Council, a 5,800+ member nonprofit community of CIOs, CTOs, and CFOs advancing TBM through education, trade standards, and certification. The group helps IT professionals make a business case around the value of tech. To allow each organization to begin their TBM journey where they feel most comfortable, Appito segments its solutions through a persona-based approach. The suite is made of four core products — Cost Transparency, IT Financial Management Foundation, Cloud Cost Management, and Vendor Insights — with an extended menu of à la carte options. Apptio’s IT Financial Management Foundation, on the other hand, allows finance leaders to align spend with business priorities. Apptio’s SaaS products include cost transparency, financial management, and vendor insights, among other solutions. Cloud Cost Management, developed for infrastructure and operations (I&O) leaders, helps them understand, manage, and optimize public cloud usage. “We wanted to be able to offer I&O leaders an opportunity to optimize spend, identify opportunities to right-size, and reduce spending on reserve instances,” Jarod said. Finally, Vendor Insights provides analytics and decision support for each step in the vendor management lifecycle through end-to-end visibility, contract management and consolidation, and monitoring for unexpected variances. Apptio’s persona-based approach has dramatically increased time to value. Jarod told us that, for a product like IT Financial Management Foundation, Apptio has seen customers implement the tool at the beginning of a budget cycle, and then be able to use it to plan the next cycle. “Within a quarter, they’re able to implement the product, get value from it, and actually use it to the point where they are planning the budget for the next cycle within the same period they bought it,” Jarod said. Without Apptio’s TBM applications, IT professionals face a multitude of risks, including inefficient use of capital, misconceptions that IT is free, and budget cuts that stop innovation in its tracks. The hundreds of customer stories on Apptio’s site serve as a testament to this. “We’ve been the only company in the world that solved these problems at scale, and that’s the reason customers reach out to Apptio when they need to manage and plan their business,” Jarod said.